• Bruno COHN (Bruce CARTER) (5 October 1904, Angerburg, East Prussia - 12 March 1988, Los Angeles) & Edith LEWY (18 January 1913 - 1993, Los Angeles) Bruno Cohn studied law and worked as a lawyer until the Nazis prohibited Jews from practicing law. In 1940 he escaped Germany with his family for Curaçao in the Dutch West Indies. After the war the family moved to Los Angeles, where he changed his name to Bruce Carter. Phillip Carter, an Iraq War veteran, ran the Obama presidential campaign’s veteran outreach program, and during 2009 was Deputy Assistant Secretary of Defense for Detainee Affairs, until resigning that post in December of 2009. • Susanne COHN (9 May 1900, Frankfurt an der Oder - 15 March 1943, Auschwitz) & Richard TUCH (19 September 1891, Erfurt - 19 January 1939, Buchenwald) Most adult Jewish men were arrested after Kristalnacht (read more about it HERE) in November 1938, and sent to concentration camps. Most of them survived and were sent home after a month or two. Richard Tuch did not; he was murdered in Buchenwald in January of 1939. His wife and daughter then went to live with her uncle, Hugo Altman, but were deported to Auschwitz in 1943 and killed there. For the many descendants of Jacob and Friederike Jacobi, CLICK HERE. When I was about 10 years old my mother brought home a family tree that a relative had gotten out of Germany, taken with him to South America, and later brought to Los Angeles when he immigrated to the U.S. 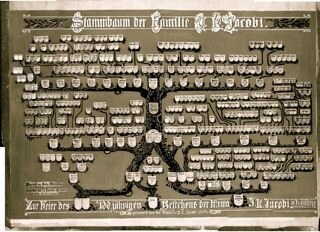 The family tree had been drawn in 1905 and was of the Jacobi and Witkowski families from Bromberg, Germany. Bromberg is now called Bydgoszcz and is part of Poland. It lies about halfway between Berlin and Warsaw (see MAP). The information shown below is mostly from that family tree. It shows the left side of the tree, which is the Jacobi family and their descendants, which includes me. You can see the original tree HERE. The FAMILY TREE that this data is from is centered around the marriage of Jakob and Friederike. The left side of the tree (the names shown on this page) shows Jakob’s family (JACOBI), while the right side shows Friederike’s family (WITKOWSKI) and her “step-family” (ALEXANDER). The top part of the tree (found HERE) are the descendants of Jakob and Friederike.